(Last Updated : 15.03.19). UPPSC Result 2019 : Lecturer Physics, Hindi, Civics & Electrical Engineering Interview Result declared - Uttar Pradesh Public Service Commission released interview result for the post of Govt. College Lecturer Biology, Advt. No. 05/209-10. 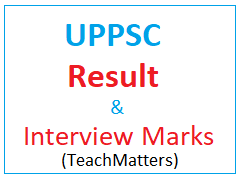 Here is the latest UPPSC Written/Interview Result 2019. Here is latest result of college lecturer posts for various departments. Name of the Department : Govt. Inter College, U.P. UPSC released interview result for the post of Lecturer Chemistry. (SCERT) Advt. No. 5/2013-14. Interview for these posts were held from 09-16 May, 2018. Name of the Department : SCERT, U.P. UPSC released interview result for the post of Lecturer B.Ed. (Higher Edu. Dept.) Advt. No. 1/2013-14. Interview for these posts were held on 3rd January, 2018. Name of the Department : Department of Higher Education, U.P. Name of the Post : Lecturer B.Ed. UPSC released interview result for the post of Lecturer Mechanical Engineering (Technical Edu. Dept.) Advt. No. 1/2014-15. Interview for these posts were held from 12th October to 21st November, 2017. Name of the Department : Department of Technical Education, U.P. UPSC released interview result for the post of Lecturer Physics & Urdu (Inter College) Advt. No. 1/2009-10. Interview for these posts were held from 25th October to 26th October, 2017. Name of the Department : State Council of Educational Research and Training (SCERT), DIETs, U.P. UPSC released interview result for the post of Lecturer Physics & Music (Vocal) (Higher Edu. Dept.) Advt. No. 1/2013-14. Interview for these posts were held from 4th September to 8th September, 2017. Physics ke bare me koi bataega. Interview kab hoga. Education ke result ki koi jankari ho to bataye..
Home science diet lecturer k interview kb honge plz sir btayen..